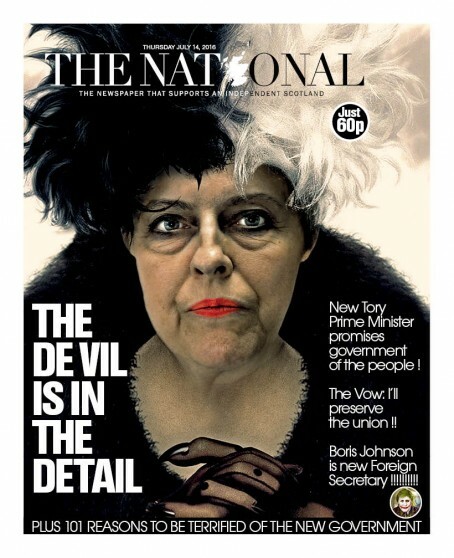 A pro-independence Scottish daily came under attack today after publishing a front-page mock-up of new Prime Minister Theresa May dressed as Cruella de Vil. It was illustrated with a mocked-up image of Mrs May donning a black and white wig as the villanous character from 101 Dalmatians. By contrast the Western Morning News kicked off six pages of coverage of the changing of the guard at Number Ten with a front page featuring a smiling Mrs May alongside her husband Philip. Mrs May’s accession to the Premiership yesterday also happily coincided with the weekly print deadline for her local newspaper, the Maidenhead Advertiser. 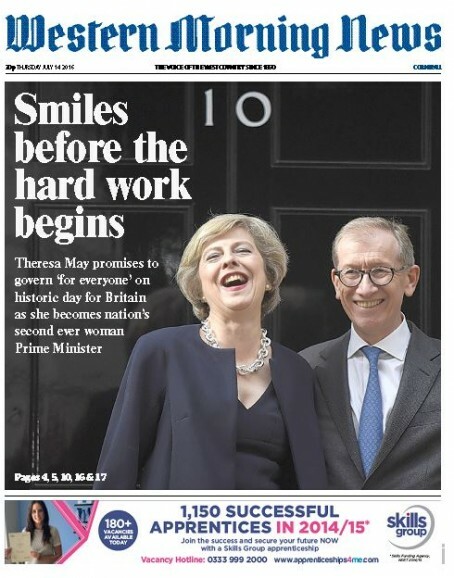 Its latest edition hit the streets this morning and it too chose to lead with a picture of Mrs May and her husband on the steps of Number Ten. 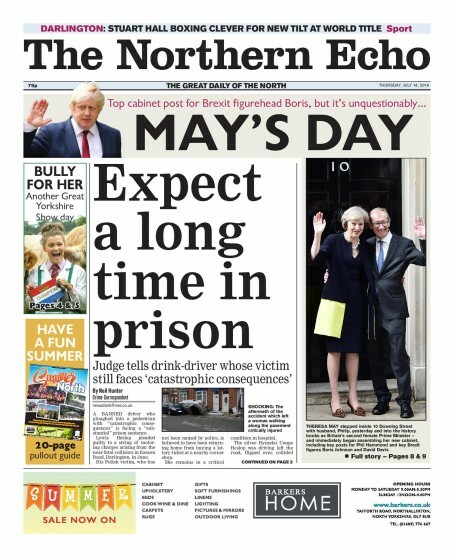 The Northern Echo chose to lead on a local court case underneath a front page plug for its inside coverage of the handover of power. However journalists at North East rivals The Journal and the Chronicle were not slow to point out the headline juxtaposition on social media. The Journal itself speculated on the future of the previous government’s ‘Northern Powerhouse’ initiative which is designed to see local business partnerships taking control of Whitehall spending in the big city regions. The policy was closely associated with the former Chancellor George Osborne, who was sacked by Mrs May in one of her first acts as Prime Minister. Infantile….but the sort of thing you might expect from a nation of losers. Not too enamoured of the National’s front page either. It’s what happens when designers take over. 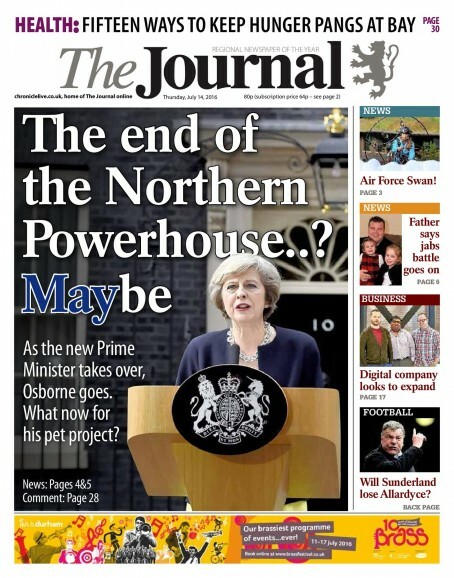 But check out the disasters that are The Journal and The Northern Echo. 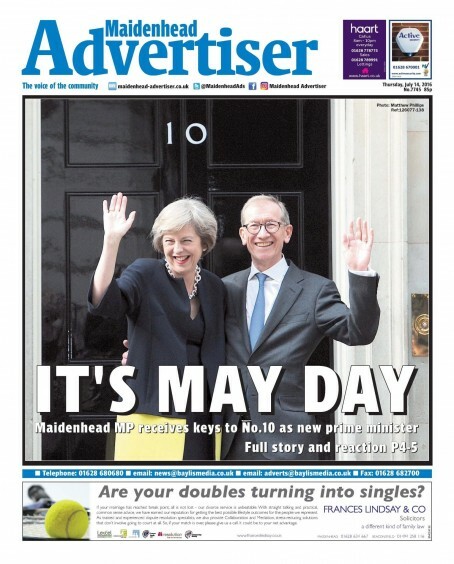 To the sub responsible for the front page of the Maidenhead Advertiser, it’s Prime Minister not prime minister. I don’t get the Cruella de Vil thing. Does Theresa May turn Dalmatian pups into fur coats? Is that what she is going to do to Scottish people who want their independence? What, exactly, is the point? Apart from someone trying to be ultra clever and failing miserably, that is. I’m not a great fan of AP style, Wazza Snapper, but they say lower case for prime minister when it’s not followed by a name. What The National has done regarding Theresa May is nothing to the abuse First Minister Nicola Sturgeon gets on a regular basis from certain sections of the press south of the border. Is this the same Express and Star that published the front page story about the mum of the fundraiser who had cancer – but didn’t have it at all? If so, don’t really think anybody from that paper has much right to comment on issues of front pages, eh? Personally, I think it’s a great front page, which at least has some humour and individuality to it, compared to the frankly forelock-tugging treatment of most of the other dailies, both regional and national…. This lower case Prime Minister style book… what does it say about Chancellor of the Exchequer, for instance? If it’s lc, chuck it in the bin! But seriously, I think it is about respect for the office. Do you write about the US president? By the way, the caps lock must have been on when I registered as REGIONAL and I’ve stuck with it. I usually loathe capitals in job titles but make an exception when it comes to high office. It might be an age thing. Not an age thing. A style thing. The National front may be a bit crass and contrived but it is the Northern Echo’s which is the really disappointing one. There is (or was until this morning’s tragedy) only one topic of conversation at the moment and to push news of a new Prime Minister – yes Prime Minister not prime minister – to the right hand side of the page to accommodate an everyday court case with a truly awful heading seems ridiculous. Respect to the Maidenhead Advertiser and Western Morning News though – good work at reflecting the national (and local) conversation. Prime Minister Theresa May. Theresa May is the new prime minister. If you follow AP style, as many publications do. What’s so hard to understand? PM , MP , WTF……keep it lower case. Overpaid public servant no respect is deserved. Still, on the bright side the Nice killings kept St Jo of Cox off P1. Remember her anyone?